If you listen to the Television Celebrity Chiefs and browse over a few top Gastro Pub menu's in summer, you'll hear the Chiefs get quite vocal over the similarity in taste and texture between Bass & Black Bream, you'll also read on the menu's the diverse preparations and culinary partnerships the humble Black Bream has married itself to, indeed the Black Bream has become the 'scoff' of the Pimms brigade and knowledgeable 'foodie' alike. 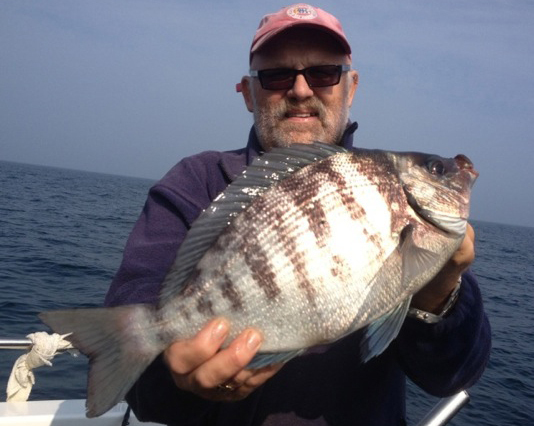 It's not where the similarities stop though, fishing for Black Bream / Sea Bream on light gear can offer fantastically reliable sport from early summer until the clocks roll back to announce the start of Cod Season! Whilst they don't grow to the spectacular double figures of the Bass, a 3lb bream is very good fish, and will let you know it's worth from the very instant you connect with the plucky bites to the moment the skipper slips the net under the electric blues and silvers that suggest the name 'Black Bream' couldn't be further from the truth. Only when the Males start 'nesting' will they turn quite dark. The Bream arrive at our inshore Reefs late spring and the early fish although few and far between can be Huge fish of a lifetime specimens. As the year goes on and summer is well underway, the Bream are here in good numbers and consistent sizes above the 1lb mark. Fish exceeding 3lb are well within the capability of any angler willing to put the time and effort in. Light Leads & Little Hooks = Big Fish! Bream fishing is mostly done at anchor and often in light tides, this can be great fun but inducing the Bream to feed will require fishing a lead light enough to bounce back in what water movement you have. Despite what I tell you later, they'll not hook themselves. 1oz to 3oz leads are quite commonly used when there's little tide and 5oz to 8oz will be plenty depending on the Rod, Braid and Snood you're using. I like a soft tipped rod with a bit of length for Bream fishing. I find I can work a small bait much better downtide with light leads and the fight from a small Bream on such light gear is truly great sport, a Big Bream on light gear is why so many keep coming back for more. Some anglers prefer to use a fixed spool reel for light Bream fishing as casting becomes easier for most and can offer an advantage of the very hardest of fishing days. That said, in even the modest of tides a light weight just tripping bottom will soon trot past the distances achieved with a cast, Bream like the movement and will often hit a bait as it lifts off and drops back down to the Reef. In my opinion it's a great way of fishing. As with Bass fishing, the Black Bream likes the clear waters and fluorocarbon snoods will offer an advantage over standard mono. You don't need overly long snoods with 2ft plenty on most days. The addition of a single bit of 'Bling' can be advantageous too. A simple 8mm fluoro bead nestling immediately above the hook will often out fish the undecorated snood. I've flirted with floating 'Gemini' styled spotted and silver beads with reasonable success too. Bait wise, half a ragworm or a sliver of Squid mounted on a Size 2 short shank or Semi Circle hook and running ledger rig bounced back in the tide will ensure you stay connected to the bait. It's well worth fishing the full Squid head, including tentacles, for a bonus Big Bream. Ether way, you'll not mistake the tell tail plucking of the Bream. 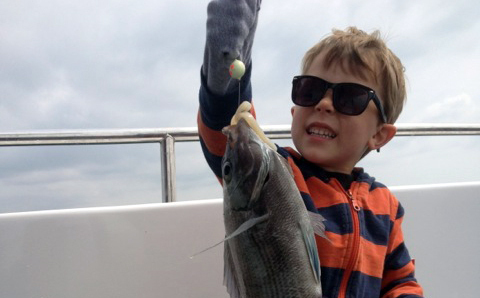 Skippers Tip: If there's a few fish about, give a whole Squid head a try. It's often crucial to let the bite develop as the fish plucks and rips at a bait, that's why circle and semi-circle hooks are so effective. Often not striking the initial bite is key, rather just let the bite develop into a hooked fish. Once Hooked, it's best not to pump the fish with the rod, rather a slow smooth retrieve as if you were Turbot fishing. Bream have a small hard mouth for putting away crustaceans and worms and frequently slip the hook of an over eager angler. As I've said earlier, fishing is mostly from anchor and rigs need be nothing more than a light lead, running slider, a swivel and a hook (plus bead if you prefer) - even I don't mind the loss of one or two Bream rigs. Alternatively, a two or three hook paternoster rigged with short snoods can be just as effective, if you're using circle hooks it's ultra important not to strike at the bites, just let them develop and the fish will hook itself. Wessex Bream Rig, or Running Ledger both work well. A Wessex boat rig, is the 3rd rig worth a mention, and on it's day can be deadly for Bream. The Wessex Rig is a 2 up and 1 down rig with a small sliding boom below two paternoster snoods and above a swivel that connects the bottom snood. The bottom snood if often the one I put a larger hook and Squid head on. 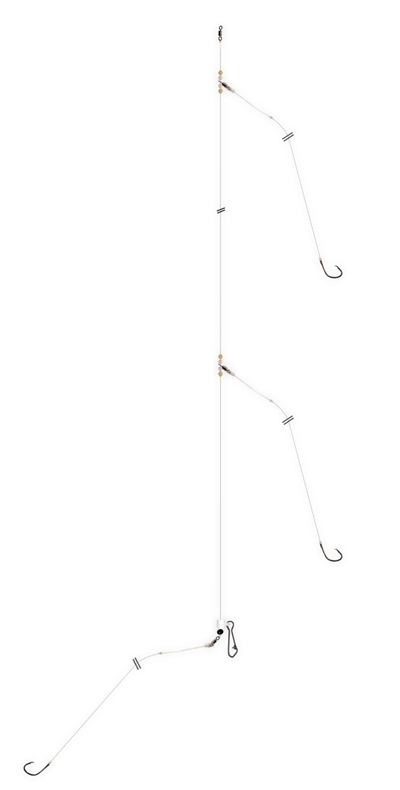 Effectively the bottom hook fishes the same as running ledger but the top to hooks fish as a two hook paternoster, giving the best of both worlds. Give it a try. 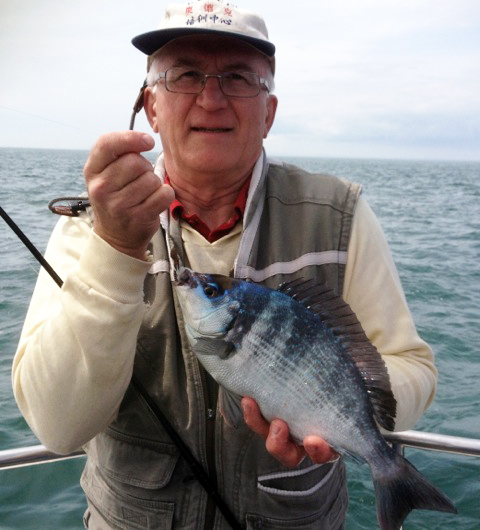 As with a lot of fishing, Black Bream fishing is a matter of putting in a bit of effort to get maximum results. The rewards when the day goes right are simply stunning.